We continue our love for garnet wedding and engagement rings with some truly stunning symbols of your devotion that you can use for your proposal. If you’re already married, why not propose again? That’s the kind of romantic gesture that could lead to years of forgiveness if you messed up for some reason. At LYT, we comb through tons of pretty and not-so-pretty rings to find the best choices for the love of your life. This is a beautiful wedding band that could accompany many of the other rings on this list, which is why we started with it. Keep a wedding band in mind when you’re searching for your proposal ring. It’s also a great anniversary band. It’s made with solid 14k gold. There are garnets all the way around this band. they weigh a total of 0.20 carats and are held in a prong setting that will keep them secure. 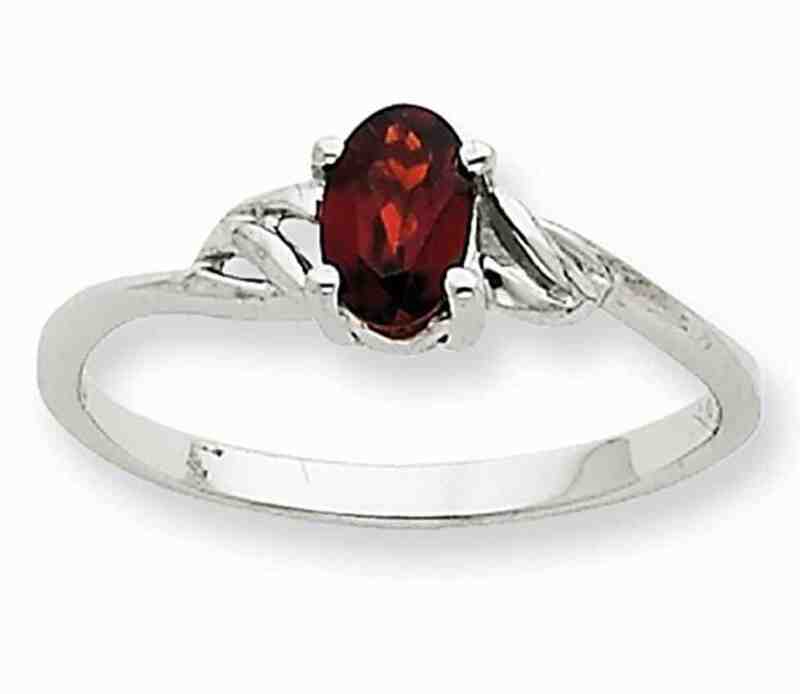 The white gold of this ring holds simulated garnet that are a red color with a minimum clarity of VVS1-VVS2. This affordable ring will ensure that you are able to give her a beautiful gift for your anniversary or to accompany the beautiful proposal ring as your wedding set. The ring is available in sizes 5 through 10. This sterling silver ring has a hard coating of platinum that will keep the band shiny for years. The band is stamped with .925, so you know it’s geniune silver. The main stone is a cubic Zirconia in a beautiful princess cut. 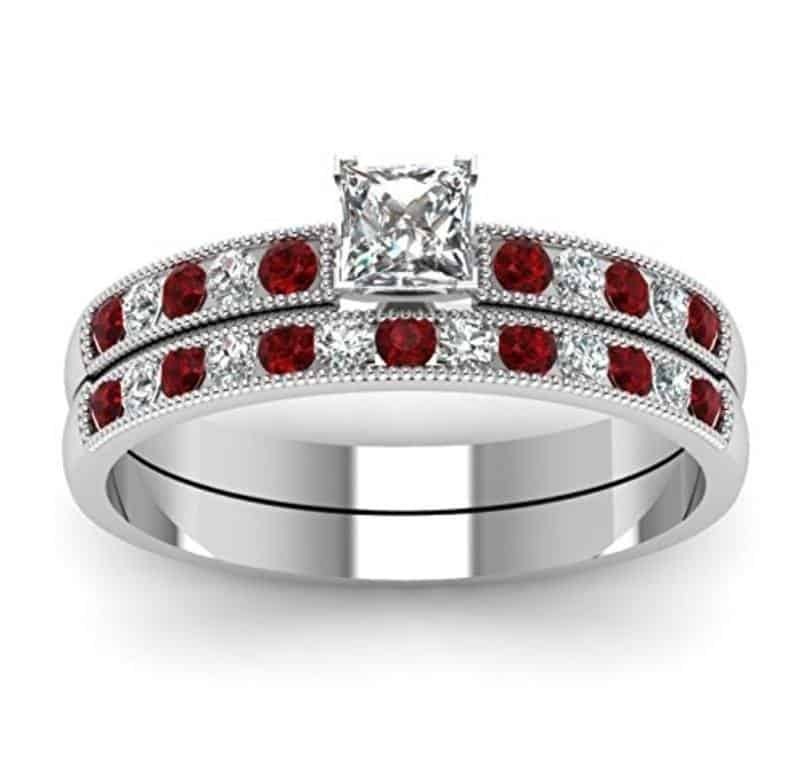 On the bands, there are round, white CZ stones that alternate with round, red garnets. The edge of the bands is covered with a line of millgrain, which is a delightful detail that gives it extra special style. The stones are all held with a prong setting, and the entire width of the rings are 3 mm. The ring comes in sizes 5 through 12. This bridal set means that you don’t have to worry about finding a matching band for your wedding day. This beautiful solitaire engagement ring was designed with an oval garnet held with a simple 4-prong setting. The band is a white gold polished to bring out a beautiful shine. 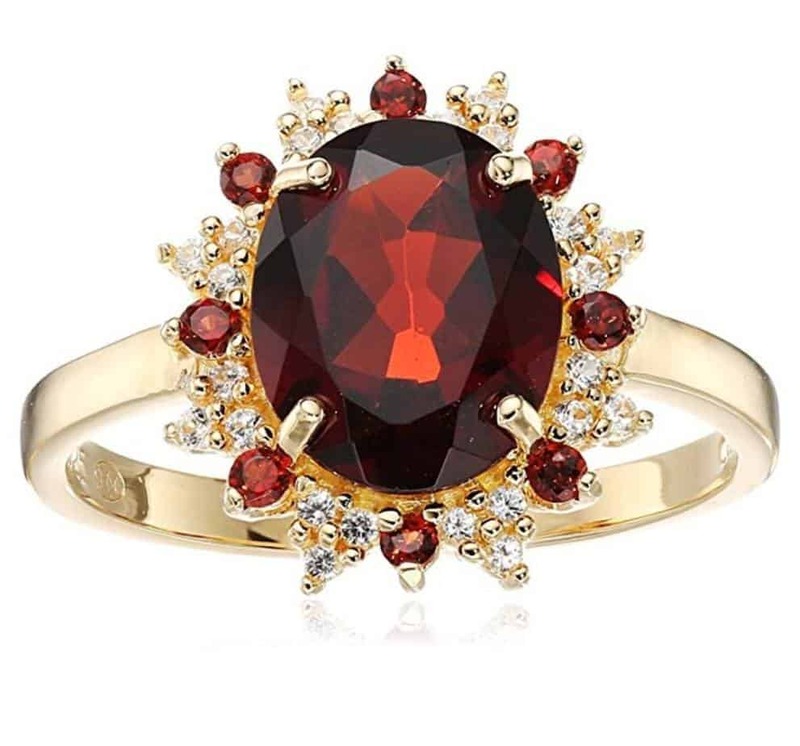 The contrast between the rich red of the garnet and the polished white of the gold makes this a truly stunning ring choice. It’s affordable for those who might be on a budget, but want a wonderful ring for their beloved. The garnet is natural and untreated. The band is resizable, and it has beautiful twisting details on the sides of the stone. This gives it more dimension and visual interest than if it were a simple band. The twist is a good one that she’s sure to love when you present it during your proposal. 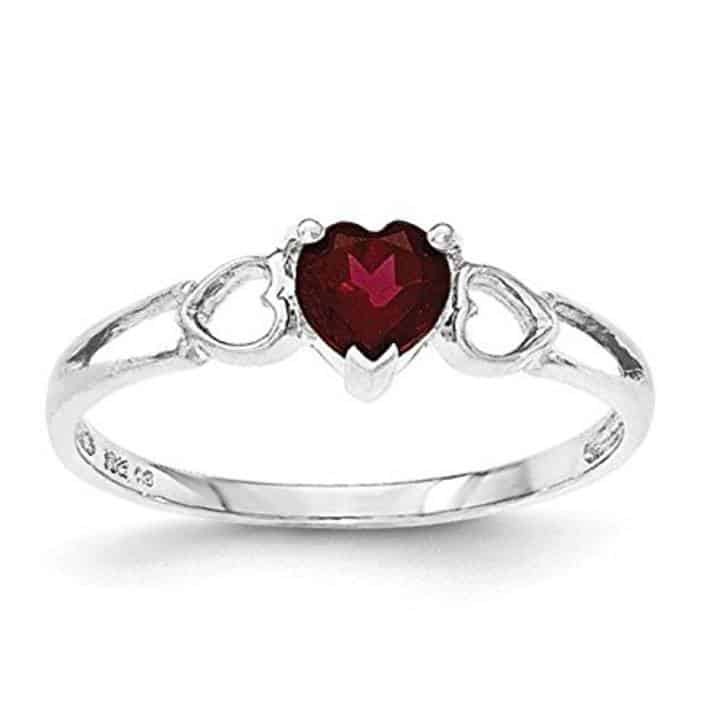 When discussing garnet engagement rings that will scream your love from the hilltop, there had to be a red heart shaped ring on the list. You’ll know this is genuine white gold because of the stamp on the interior. This is aRrhodolite garnet of 0.60 carats, which is a bit lighter in color than a regular garnet. This is perfect for a heart-shaped engagement ring. You can’t go wrong with the color of the ring’s stone, whether it’s a light pink or a deep red. The ring is available in sizes 4 through 13 and includes half sizes. This is truly a ring that anyone could wear. As usual, we saved the best for last in this list of our favorite garnet engagement and wedding rings. The band is sterling silver with a coating of real 18k gold. The large middle stone is a garnet of 2.66 carats. The starbursts surrounding the middle stone are created white sapphires and garnets. The sapphires are 0.17 carats while the garnets are 0.18 carats. This is a unique ring inspired by royalty. While the original ring belonging to Lady Di and one that was worn by Kate Middleton was sapphire, this is a beautiful alternative in red. When she gets a ring like this during a proposal, she’d be blown away, and you might even mention that you find her to be a princess who deserves a “Lady Di” inspired ring. 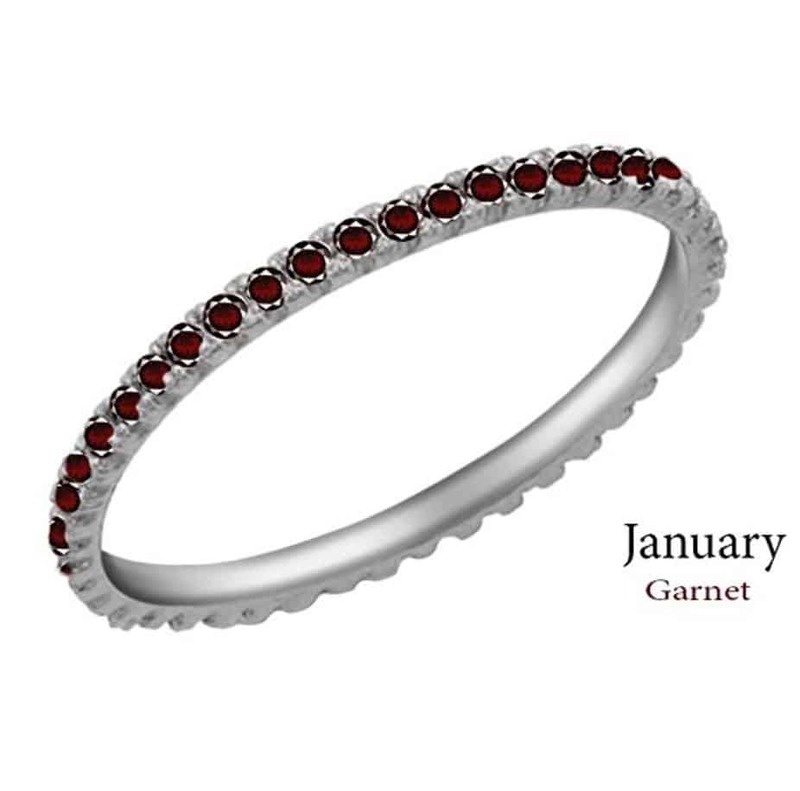 Garnet is a terrific alternative to more expensive gems, and they have special meaning since garnet is the official birthstone of January babies. She doesn’t have to have a January birthday to appreciate the deep red color of these gems, though. They’re symbolic of the love the two of you share. They’re different than a diamond, which she’s likely to appreciate if she isn’t into traditional rings.